Introducing Hemimorphite, a curious mineral of unusual structure. Read on to learn about this unique and often very beautiful crystal, and why it is known as a stone of transformation, good fortune and creativity. Chemical Composition: Zn4 Si2 O7 (OH)2 -H2O, Hydrous Zinc Silicate Hydroxide. Hemimorphite is a silicate mineral, belonging to the sorosilicate subclass, and is most commonly found in the oxidized zone of zinc deposits. It is, in fact, the product of the oxidation of zinc ores. It comprises of about 67.5% Zinc Oxide, 25% Silicon Carbide and 7.5% water. Hemimorphite derives its name from its unique crystal forming habit. “Hemi” and “morph” are Greek words meaning “half” and “shape” respectively, and the term “hemimorph” refers to crystals which form with different shaped terminations at either end. One end of a hemimorphite crystal terminates with a pyramidal point, but the other end is blunt, terminating with what crystallography refers to as a “pedion”, or flat face. To see this phenomenon, one would need to find complete crystals that were visible from two or more orientations. Hemimorphic crystal formations are relatively uncommon in the mineral kingdom. Elbaite tourmaline and zincite are other examples of hemimorphs. Generally, hemimorphite crystallizes in one of two forms. It will either form as long, thin flat blades of well defined crystals, or as a botryoidal crust, coating the surface of the rock cavity in which it formed (“botryoidal” refers to the resemblance to a “bunch of grapes”). An interesting characteristic of hemimorphite is that it is pyroelectric (it generates electrical potential when heated) and piezoelectric (generates an electric field when subjected to mechanical stress). Hemimorphite ranges in colour from clear to white, yellow, brown, green and various shades of blue. Some of the most striking specimens are bright blue. Under ultraviolet light, hemimorphite sometimes exhibits fluorescence, and appears orange. 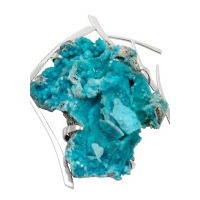 Other than being prized by mineral collectors, hemimorphite has been mined for its high zinc content. Hemimorphite is known for the sense of joy, good fortune and spirit of creativity that it encourages. It is a stone for wellbeing, balance, and personal evolution and is said to aid one in acquiring self-knowledge and developing self-acceptance, leading to a state of egoless self-confidence. As the joy that hemimorphite engenders is born of self-acceptance, it is a joy that is balanced with the reality of ones life, meaning one can face grief or sorrow without resistance and still feel the undercurrent of joy. 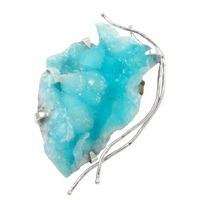 Hemimorphite encourages us to be practical and resourceful. It helps us to look beyond negative traits and emotions such as anger, to understand the root causes of these traits and to nip them in the bud. In the space created, we are free to develop more advantageous ways of being. It enables effective communication of our feelings without heated emotions clouding our judgment, thus it may be beneficial for healing rifts in relationships. 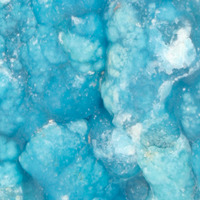 For those with a propensity for clairvoyance, hemimorphite is said to aid development of ones talents. It may attract spirit guides to those who are ready. Practitioners of healing may find that it encourages empathy for the patient. As hemimorphite ranges in colour significantly, one may notice different energetic outcomes between specimens. White and colourless hemimorphite will activate the higher chakras and assist in integrating higher or subtler frequencies of energy. Blue hemimorphite will activate and energize the heart, throat and third eye chakras, and can facilitate clairvoyance and other visionary abilities. Brown specimens will ground and integrate light energy in the physical body, promoting physical healing. Brown hemimorphite is excellent for working with nature spirits and other such elemental energies. 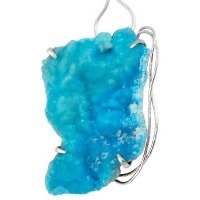 For physical healing, hemimorphite has been attributed with soothing ulcers, pain control, combating herpes, dealing with hormonal changes, easing PMS symptoms, aiding with weight loss and getting into shape. 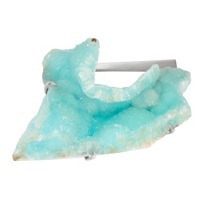 Hemimorphite relates to the astrological sign of Libra and vibrates to the number 4.